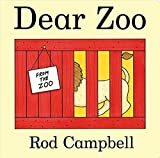 Dear Zoo by Rod Campbell*, and a tuff spot sensory activity to go alongside it. Dear Zoo – What’s the Story? Dear Zoo is a lift-the-flap story of a request for a pet, sent to the zoo. 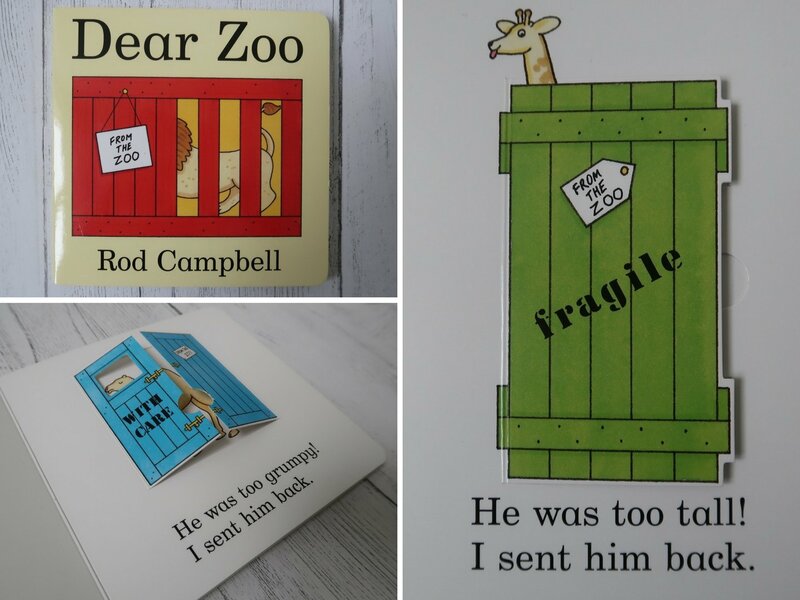 Each page of the book reveals a different animal that the zoo has sent, but isn’t quite right. Will the zoo ever send the perfect pet? 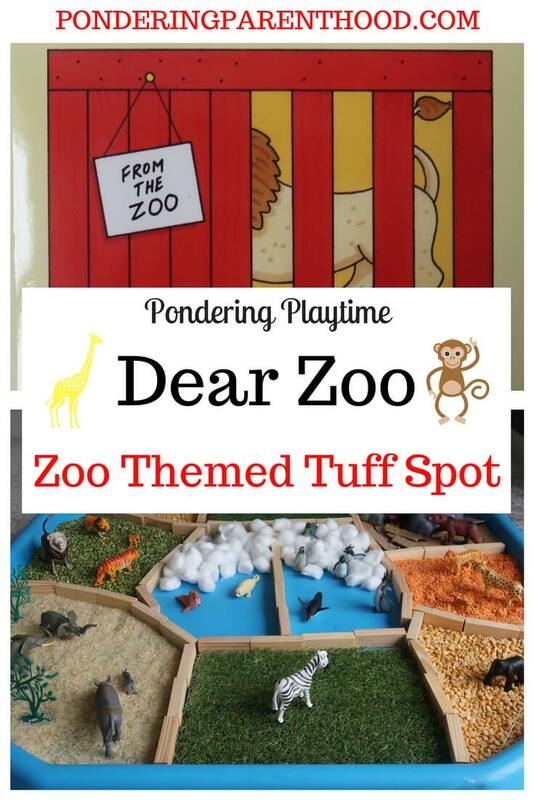 We haven’t had the tuff spot out since our icy Lost and Found polar activity, so I thought I’d do a zoo themed sensory tuff spot to go with Dear Zoo. I know it looks like a lot of work, but it was actually really simple. I used Jenga blocks to create the different ‘zones’, then used rice, split peas and lentils to create the different coloured sensory areas. 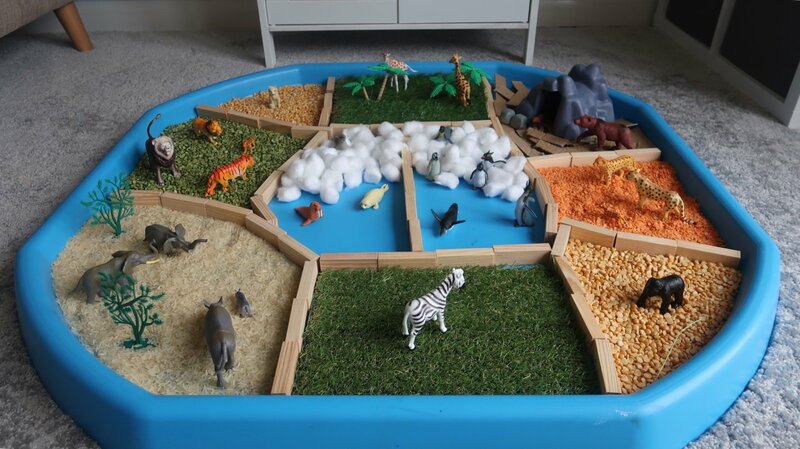 I also used artificial grass samples for the zebra and giraffes, and strips of cardboard for the bear ‘enclosure’. The bears’ ‘cave’ is the tunnel out of M’s Brio train set. Lastly, I used cotton wool balls to create the polar zone! I’ve made a little video to show you the zones in more detail. Rice, lentils, split peas etc. Jenga pieces – although you could easily use pieces of train track or play farm fences if you have them, or even nothing at all – the different colours and textures will provide separation of the different ‘zones’. 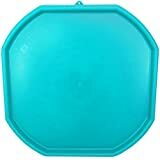 Artificial grass pieces – lots of artificial grass suppliers offer these free of charge. Plastic trees, rocks or anything else that you can find that will fit the theme! We’ve had a copy of Dear Zoo since M was tiny, so she’s grown up with it. She still picks it out of her book box to read, though, and loves lifting the flaps and making the sounds of the animals. It’s been lovely to see how she’s progressed from a basic, “raaaaarrrr!” for the lion (and some of the other animals, too!) to being able to make the sounds of most of them. Although, if anyone can tell me what noise a giraffe actually makes, that would be great! I think this has probably been M’s favourite tuff spot activity so far. 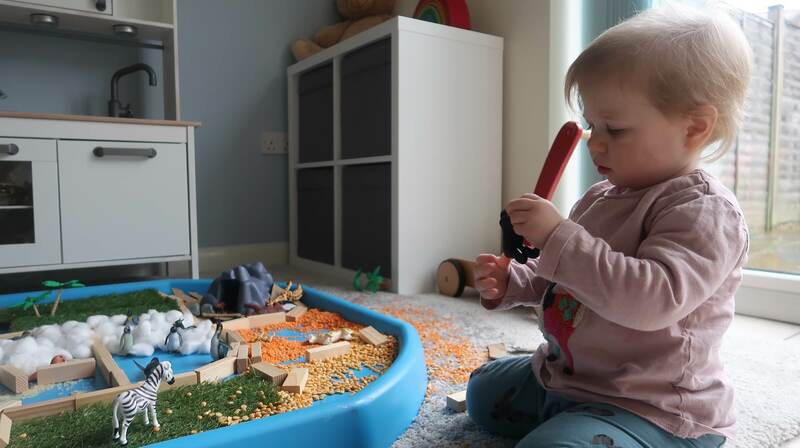 She loved feeling the different textures, running them through her fingers and pouring them onto the rug! M got really stuck in and actually ended up sitting in the middle of the tuff tray at one point, when she usually sticks to the edges. Definitely a winning activity! 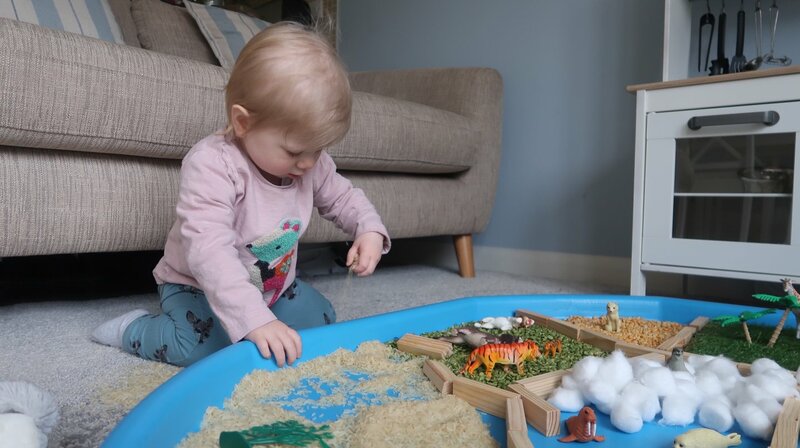 If you enjoyed this, you can find more Pondering Playtime activities here, and you might like to join my Early Years craft and activity Facebook group; Play Craft, Explore. We’d love to have you! And don’t forget to pin it! "Ponderings on Two – Advice from Messy Blog UK"
Yep I am planning a farm one for later in the year! Ours is permanently out in the living area of our kitchen at the moment.